This week is National School Choice Week. In North Carolina, the week’s main event was yesterday’s rally, attended by Superintendent Mark Johnson. But hopefully the week will also serve as an opportunity for reflection. The track record for North Carolina’s school choice programs – charter schools and voucher programs – has been lackluster. The movement could benefit from less cheerleading, and more reckoning with evidence. School choice is based on the assumption that school performance for all students will improve if schools are forced to compete for resources. Schools are mostly funded on the basis of student enrollment, so School A will lose money if Timmy leaves to get a better education at School B. The premise of school choice is that School A will work extra hard if it has to compete with School B to avoid losing students and the associated funding. Charters and vouchers were supposed to deliver additional benefits beyond simply spurring competition between schools. Charter schools were created to be laboratories of innovation, creating new, improved ways of educating students that could be copied by traditional, inclusive public schools. Vouchers are supposed to save the state money, while also spurring competition. 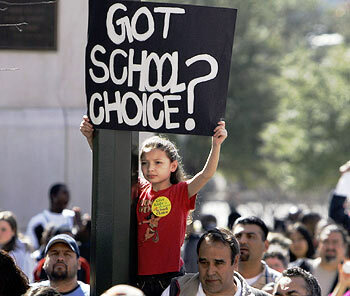 What is the current status of school choice in North Carolina? 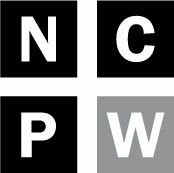 Charter schools: North Carolina currently has 173 charter schools educating over 100,000 students (about 6.5 percent of all public school students). The sector has been growing rapidly since the 100-school cap on the number of allowable charter schools was lifted in early 2011. Two of these schools are virtual charter schools, in which all instruction is provided on-line. Vouchers: North Carolina has two voucher programs. The Opportunity Scholarship Program, authorized under the 2013 budget bill, provides vouchers of up to $4,200 per year to students from families with an income below 246.05 percent of the federal poverty threshold. In the 2016-17 school year, 5,624 students received $21.8 million worth of vouchers. The other voucher program, the Disabilities Grant Program, provides vouchers of up to $8,000 per year to allow parents pay qualified expenses for children with disabilities who attend a private school. In the 2016-17 school year, 1,082 students received Disabilities Grants. Personal education savings accounts (PESAs): PESAs are similar to the Disabilities Grant Program voucher, but the funds can be spent on more than just tuition. PESAs provide parents of disabled children a debit card loaded with $9,000 to be spent on the child’s education. Funds from the debit card may be spent on tuition, fees, and other broadly-defined goods and services for students. Awards of up to $3 million will begin effective the 2018-19 school year. Of course, public school districts may also offer school choice options. School districts may allow students the choice of enrolling in magnet schools, or specialty schools such as a cooperative innovative high school. Districts may also implement school assignment plans that take into account parents’ school choice preferences. What do we know about how well they’re doing? Test-based student achievement measures show that, on average, charter schools perform just about as well as their peers in traditional public schools. There tends to be, however, greater variability in charter school achievement, with the charter sector having a greater share of both low-performing and high-achieving schools. 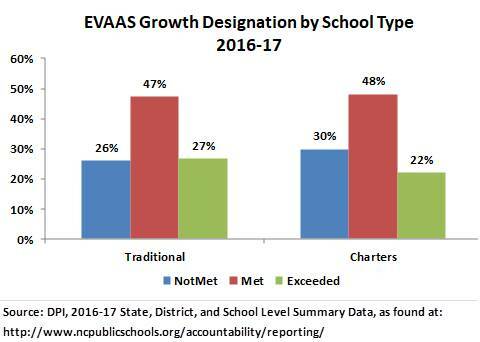 This relative decline in North Carolina charter school performance is thought to be related to the poor performance of newly-opened charter schools. These schools were opened after the General Assembly lifted the charter cap and loosened approval standards. North Carolina’s charter sector is also contributing to the racial segregation of our school system, and creating budget pressures for traditional school systems. It is unclear whether traditional schools have adopted any “innovations” learned from North Carolina’s charter school experiment. The “innovation” of most successful charter schools involves raising private sector funding to provide smaller classes and extended learning time. Further, “innovative” charter schools can transition failing students back to their home school system. The experiment of virtual charter schools has been especially troubling. Virtual charter schools have been a dismal failure wherever they have been tried. Nationally, virtual charters are infamous for their abysmal test results, while virtual charters in several states have been found to falsify enrollment counts in order to defraud state taxpayers. North Carolina’s two virtual charter schools are in their third year of operation. In both years, the schools have received a school performance grade of “D” and failed to meet growth. In fact, the schools have been ranked in the bottom 1 percent for school growth in each of their first two years of operation. To date, the Department of Public Instruction has not been provided the resources necessary to audit virtual charter enrollment figures. Many “buyers” of education (i.e., students) whose demand for education is sizeable enough to motivate schools to improve their operating practices to attract or retain students. Many “sellers” of education (i.e., schools) available to students. The schools must face a meaningful number of competitors to motivate improvements, and students need sufficient choice to find schools that best suit their unique learning needs. Good information on school quality in order to allow parents to make informed enrollment decisions. Without good information, enrollment may be driven by marketing schemes, rather than quality improvements. Without all three of these elements, school choice fails. Of course, good information does not guarantee success. Even in states with better accountability requirements, voucher programs have failed students. Recent evaluations of voucher programs in Indiana, Louisiana, and Ohio have uncovered incredibly poor test results for voucher students. What little we know about North Carolina’s Opportunity Scholarship program is troubling. Schools receiving Opportunity Scholarship funds discriminate against students on the basis of religion and sexual identity. An employee of the state’s largest Opportunity Scholarship recipient embezzled $400,000, yet he remains gainfully employed by the school, and the school continues to receive tax-payer subsidies. Further, the program fails to save money for taxpayers. Just under half (45 percent) of parents who applied for but did not end up using an Opportunity Scholarship said they enrolled their children in private schools anyway. Clearly, North Carolina’s school choice advocates could use less cheerleading, and more introspection. School choice has failed to deliver the promised results. School choice options are failing to lift academic achievement. Charter schools are not developing and delivering scalable innovations to traditional schools. North Carolina’s major voucher program lacks accountability measures and negatively impacts both the state and school district budgets. PESAs share the disadvantages of North Carolina’s Opportunity Scholarship program while opening new avenues for fraud. As school choice has expanded, North Carolina’s education system has suffered. The state’s performance on the National Assessment of Educational Performance (NAEP) has plateaued while Black and low-income students have fallen further behind their white and higher-income classmates. North Carolina’s ranking, as measured by Education Week’s “Quality Counts” report continues to plummet. Despite the economic recovery, inflation-adjusted per-student state funding remains 7 percent below pre-Recession levels. North Carolina’s focus on school choice distracts policymakers from addressing the actual barriers to student success. Students flourish when taught by great teachers in clean, adequately-supplied classrooms. Additional investments can ensure that students arrive at school healthy, free of hunger, and focused on learning. Unfortunately, evidence indicates that school funding suffers as states expand their reliance on school choice. North Carolina’s lawmakers continue to be swayed by the false hope that “the magic of the free market” will improve student outcomes without requiring additional investment. If school choice could deliver on those promises, it would indeed be an achievement worthy of a week of appreciation. But the movement’s track record shows little to be proud of.